Are you ready to see Nick and Rachel on the big screen? While you should definitely re-read the book for Eddie’s hilarious antics alone, the plot goes a little something like this: Our leads are Rachel Chu, an American-born Chinese with a promising career as an economics professor at NYU, and her boyfriend Nick Young, who also teaches at NYU (his field is history). 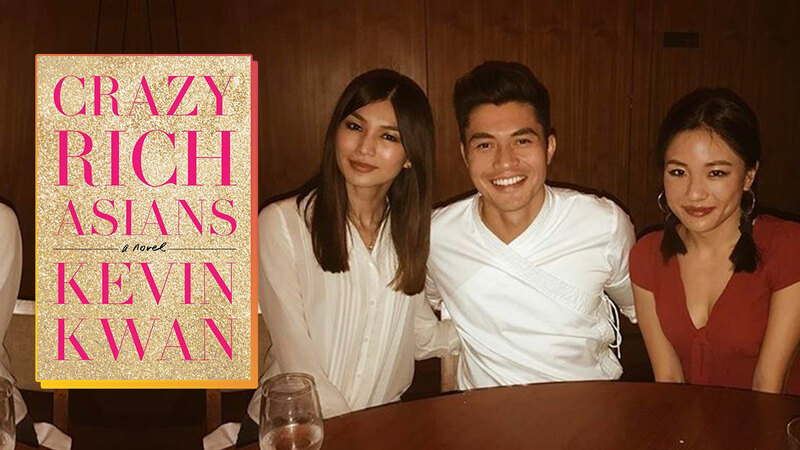 Overseas, three elite Chinese families—the Youngs, the Shangs, and the T’siens—are introduced to the reader ahead of the wedding of the year century between the rich (and handsome) Colin Khoo and fashion icon Araminta Lee. The twist? Nick is from one of those rich Chinese families and has yet to tell Rachel. The wedding brings them to Singapore, where Rachel meets Nick’s family for the first time. Someone really should have warned her about Nick’s mom, Eleanor. Constance Wu plays Rachel, with newcomer Henry Golding as her Nick. Michelle Yeoh has the honor of playing Nick’s mom Eleanor, while Gemma Chan will play Nick’s cousin Astrid. The star-studded list continues: Harry Shum Jr. plays Charlie, Astrid’s ex; Awkwafina plays Goh Peik Lin, Rachel’s college BFF who lives in Singapore; Ken Jeong is Peik Lin’s dad; comedian Ronny Chieng is Nick’s cousin Eddie; Sonoya Mizuno is Araminta, and Remi Hii is Nick’s other cousin Alistair. According to Variety, Chu was hired for the job after putting together a visual presentation of his family photos for producers Nina Jacobson, Brad Simpson, and Jon Penotti. Chu's filmography already includes two Justin Bieber documentaries, three Step Up movies (he directed two and executive produced one), and the second installment of the magic heist flick Now You See Me. As Lainey Gossip points out, the date is likely intentional, seeing as eight has always been viewed as a lucky number in Chinese culture. In addition to opening in the eighth month in a year ending in “8,” the date itself, when taken apart to become a math equation, boils down to the damn number: 1+7=8. Too much? Too bad, because phonetically, “18” also sounds like the expression for “will be rich.” Crazy Rich Asians will be rich. I already love this movie! Which explains these beautiful behind-the-scenes photos, courtesy of the cast and crew.